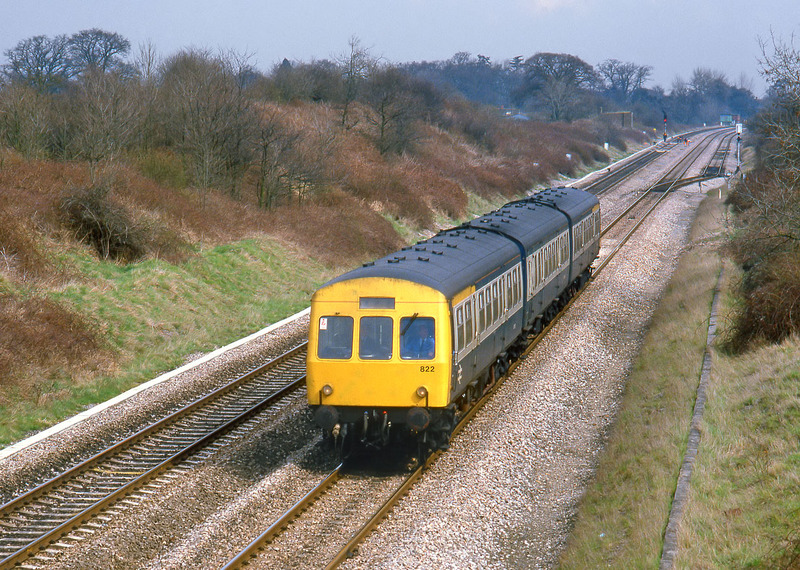 822 (51495, 59096, & 51510) passes Little Haresfield (near Gloucester) with the 10:30 Cheltenham to Swindon service on 24 April 1986. The blotchy yellow on the front end is not the fault of the early Fujichrome slide (sometimes noted for bizarre colour), but is the result of some inexpert touching up of the paintwork. 822 was split up in 1988 and withdrawn shortly afterwards. 51495 and 59096 were cut up at Mayer Newman, Snailwell, and 51510 ended its days at Vic Berry's, Leicester.